I recently made an attempt to expand my diet. I was thrilled with the idea of eating more fruits that were previously on the list of foods that aren’t good for one’s blood sugar. The trick was to find some that don’t trigger an allergic reaction in my gut. I started with cantaloupe then mulberries. But something went wrong. Shortly after I introduced mulberries, all my symptoms got worse. I was having more neurological problems, digestive problems, joint pain and light sensitivity. I assumed that the increase in symptoms was caused by the Lyme infection becoming more active as the time since I last took antibiotics got longer. Something told me to ask my naturopath about the mulberries when I went to see him. I wasn’t sure if it was the mulberries or if something else was going on, and he was the one who helped me figure out the rest of the allergies. I learned a few things during the visit. First, mulberries have malvin in them. Malvin is a naturally occurring compound in many fruits and vegetables. It is most commonly found in foods that are red or purple. It is also found in foods that come in red and purple varieties, even if the variety itself is not those hues. The key example is corn. In the years since I figured out my food allergies, I avoided corn and red and purple foods. I was hoping mulberries, being white, weren’t a problem. Lo and behold, they have plenty of malvin in them. When I came home, I found a more extensive chart of foods that contain malvin. As I stared at the list, I discovered several foods that I thought were “safe” for me to eat. These include: olives, cabbage, carrots, avocado, cashews and (green) apples. As I read through the list, I started thinking about my relationship to these foods. Let’s take it back to mulberries. When I started eating them, I craved them. I wanted more and more and more. I would get a slightly nauseated, slightly hungry feeling after I ate them. Then for a day or two, I didn’t want to touch them. Then I craved them again. So I’ve been paying attention to my reaction to these other foods. Each of them are foods I have problematic relationships with. Once I have an avocado, I want another one each day for several days. Then suddenly, I don’t want to touch them for a month or two. The same goes for carrots, cashews, apples and olives. Sometimes when I eat these foods, I get an unexpected gas attack, swollen abdomen, headache or stools that show evidence of intestinal swelling. The unexpected nature of these symptoms stemmed from not know I was eating an allergenic trigger. Cabbage is even more tricky. When I eat it, I eat a ton of it. I get gas and loose stools, but I was expecting those because the cabbage is supposed to clean out my gut. So I’m not sure I want to give it up altogether, the way I’m doing with the other foods on the list. The next thing I noticed is that the neurological symptoms started to recede after a few days without eating mulberries. After a week, my abdomen was no longer swollen and hard. My joints stopped aching globally (except when I was exposed to excessive air conditioning). I was paying attention to these symptoms because my naturopath told me to keep track of whether the rest of my symptoms diminished once my immune system calmed down. What I think I’ve learned (again, because I’ve been through a few rounds like this over the years) is that food allergies set off an inflammation cascade in the body. If the inflammation gets triggered over and over, it starts to affect other areas of the body, not directly affected by the food sensitivity. Then all the Lyme disease symptoms get activated by the inflammation signals in the body. The process seems reversible. Once the allergen is removed (or no longer ingested), the allergic reaction calms down. The inflammation process is no longer fueled. Then the Lyme disease symptoms stop being continually aggravated. Needless to say, I’m back on the straight and narrow diet. I ordered sunglasses recently. 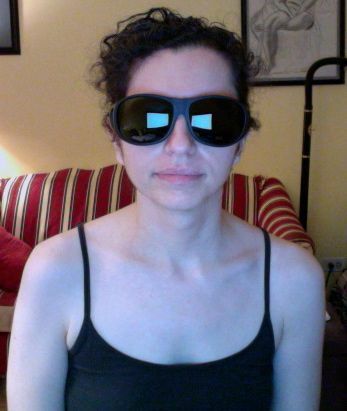 I got the kind that block 100% of UV rays, designed for people who have just had eye surgery. The glasses themselves are hideous. They are huge, taking up half my face. But before I complain too much about the effects on my vanity, I must admit that they work. I went outside with them on for a walk in bright sunlight. It didn’t bother me at all. In fact, sunlight with the glasses is less irritating than interior light without them. Unfortunately they are too dark to wear indoors. No night sweat last night, but my hair was wet when I woke up too early again. Last night I got around 6.5 hours sleep. I’m feeling much improved over yesterday. My heart was bothering me a little (rather than yesterday’s incapacitating level). I was forced to rest several times during the day, but in between, I managed to go for a walk and cook. My temperature regulation isn’t working so well. When I sit up, I get very hot. When I’m lying down, my feet get cold. My ears hurt a lot. I have floaters in my vision. My shoulders are achy and crepitant. (Crepitant is my new favorite word. It precisely describes the sound my joints make.) My appetite is a little better, so I managed to eat a fair amount today. Now my eyes and hands hurt. My eyelids itch. My spine hurts in a sharp but not too intense way. I have some muscle stiffness in my lower back on the left side. I’ve had urinary hesitation for most of the day. Mostly, though, I feel uncomfortable. I want to walk in circles to shake off some kind of emotion that seems trapped in my body. Then I try to lie down and I can’t get comfortable, and it’s the same feeling again. Something inside is surfacing. Wow, you are a trooper. But I see life is a challenge for you, at so young an age. In the last week I have been battling with some of the symptoms you have mentioned above.I am almost 60 years old. Prior I did not even recognize I had a body. I am wondering if I have Lyme disease. But also I do believe that certain foods are triggering the inflammation I feel in my body. I started to push away from gluten and eating yogurt with strawberries and blueberries, instead, craving for it a lot. And now, thanks to you, you pointed out red and purple vegetables have malvin, which could trigger an allergic reaction. I need a physicians evaluation. But, once again, thank you for sharing your knowledge. And I do hope you are feeling a lot better soon. Thank you for your comment. I don’t generally give advice, but I will suggest you see a Lyme-literate physician for testing. If you have food sensitivities that don’t show up on allergy tests (either from drawing blood or from skin pricks), you may want to find a practitioner who does electrodermal screening. Electrodermal screening catches a lot of sensitivities that aren’t classical “allergies” but still cause an inflammation response in the body. It can give you a guide of what to avoid as well as what you can eat without problems. It is easy to notice what a great read you have on the incompatibilities your body has with foods. My heart is for you to be able to eat whatever you want in freedom without any response neurologically, physiologically or emotionally. I have never responded to an internet based write up before, but reading your correspondence revealed to me that you KNOW what you are talking about with inflammation and symptomatic food responsiveness. Can you post your first name please for prayer intention. All the public information about me is on the About page. Thank you for your comments and good intentions. I’ve tried something similar to NAET, with an acupuncturist using the same principles. It had no real effect. However, I’ve come to the conclusion that most of my food responses are not actually allergies, but foods that activate the Lyme and Bartonella infections. I wrote about it in a more recent post. Since they aren’t true allergies, I understand why NAET didn’t work.